Samurai Spirits (aka Samuraï Shodown in the west) was first released for the powerful Neo Geo console on a whooping 118 Mbits cartridge. Takara handled the conversion for the Super Famicom system, only a year after its original release. 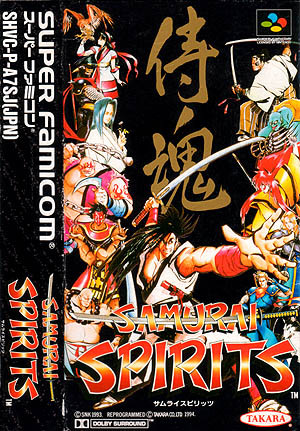 Samurai Spirits was probably one of the first fighting game to make significant use of swords and other weapons in Japanese medieval times. The evil Amakusa is poised to take over Japan, and no less than twelve fighters are on a desperate mission to stop him. Each character has a complex background story, different personalities and, of course, special moves. As aforementioned, weapons are what give Samurai Spirits its unique flavor. They all greatly affect the game and it is important to learn how to correctly use them during fights and how not to lose or drop them. Samurai Spirits also features a POWer meter. It increases as the fighters receive damage and end up raising their overall attack power (like a sort of an adrenaline rush). Three play modes are available : Arcade is a story mode where each fight ends with a short animated cutscene, 2 Players gets two players to fight against each other and, finally, a Time Attack mode. As a side note, this version was sadly heavily censored, the blood option was highly reduced and finishing moves omitted. 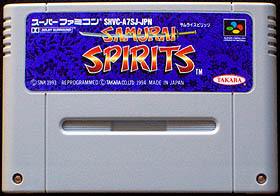 Samurai Spirits was first released for SMK's Neo Geo system in 1993 on a whooping 118 Mbits cartridge. It is interesting to notice that some characters are actually based on heroes who really existed. For instance the evil Amakusa is most probably inspired from the japanese priest Shiro Tokisada Amakusa who lived during the 17th century. 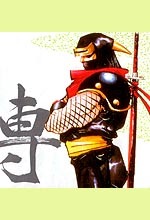 And mighty ninja Hattori Hanzō (who's also featured in the World Heroes series by Alpha Denshi Corp for SNK) is most certainly based on the head of clan and ninja of the same name who lived during the 16th century. The game gave rise to numerous sequels and many players argue that Samurai Shodown II, released in 1994, is the best of the series. All in all, five sequels were released in the arcades and numerous versions appeared for a vast selection of home consoles including Sega's Megadrive (1994), Sega's Game Gear (1994) and Nintendo's GameBoy (1994). I was a bit pessimistic at first, only the PC Engine system and the Arcade Card managed to impress me in this field. Takara's task was certainly challenging. However, Samurai Spirits is nervetheless a good conversion. Despite the size of the character sprites (they shrunk by about a half), the limited color palette, a rougher animation and the zoom effect removal, Takara managed to keep a strong and intuitive gameplay. I should also point out that there are some nasty slowdowns in a couple of places in the game, but nothing bad. Also, most of the bloody effects are still there, but are sort of tuned down. All in all, Samurai Spirits is far to impress as much as its amazing model, but yet it manages to bring a delightful conversion to the Super Famicom system.